I’m pretty laid back when it comes to travel and all the surprising and new things that take me out of my comfort zone. You just have to go with the flow and take each adventure as it comes as there’s often nothing else you can do. But I have to admit that even I was thrown for a bit of a loop when I shared not only a tiny room on a catamaran with a complete stranger, but I also shared the double bed in that room with him. 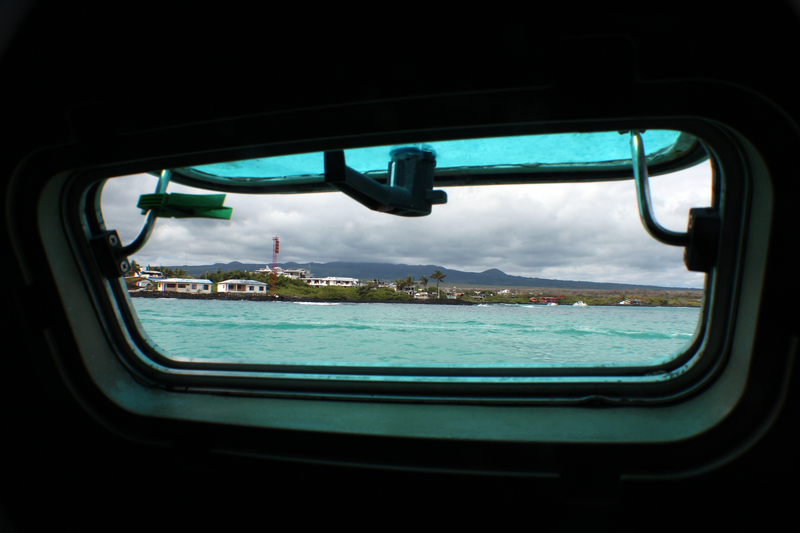 I was traveling in the Galapagos Islands and had booked a 7 day cruise on a tourist boat. Understandably, the boat is small. The staff slept where we ate on deck as there are only so many rooms, and the boat was full with an odd pairing of patrons traveling in groups and on their own. This led to lucky little me having to share a room with someone I had never met before. Which is pretty standard in the backpacking world, I just didn’t expect to have to share a bed with him as well as the room. Sharing quarters in a cramped space with a stranger can be a little tricky during the best of times, but sharing the bed brought into play a whole new level of coziness. I guess I can be thankful that it was a young and good looking backpacker and not an older man on holiday. And really, I’m fairly certain my fellow bed-mate probably didn’t mind too much to share a bed with a pretty young woman over someone older as well (if I can be so cavalier). Our cozy boudoir. Bathroom on the left, storage on the right, and straight ahead is where all the magic happened. So we worked it out and made a plan. I would sleep on the edge, he could have the inside (all 6’3 of him) and he would take the sheets and I the blanket since I tend to be cold more often than not. It was the best we could do in an odd situation and we made light of it and got along quite well. To add to the adventure of keeping to our personal space on the tiny bed, each night we would travel between islands; a trip which usually took 10-12 hours. On a small catamaran you really feel each wave and there was a lot of pitching and rolling (and some resultant motion sickness). The offending window that soaked us in the middle of the night. It also happened to be quite warm underneath the boat, so Mr. Bed-mate and I would keep the windows open to cool off with the lovely fresh breeze from the ocean. In doing so, we learned a very good lesson. 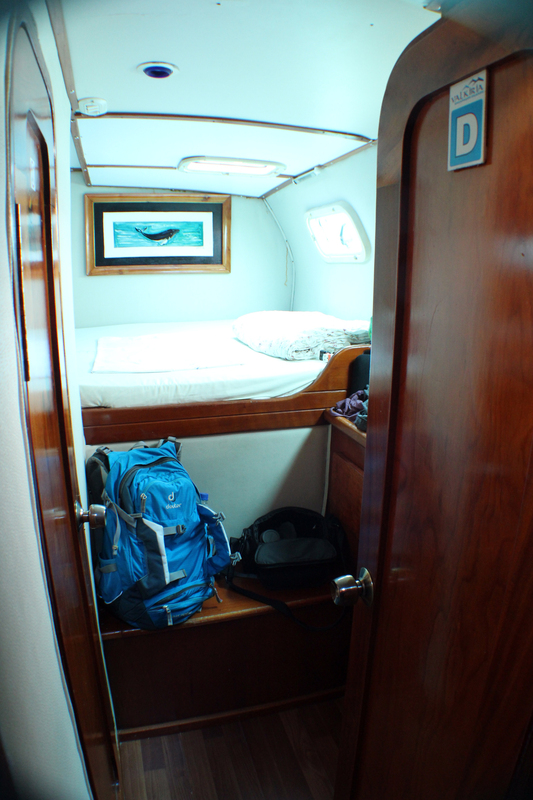 Who would have thought that on an ocean, in the bottom of a boat, waves might just launch themselves at your window and onto your warm and dry bed? Not us, obviously. On our second night of bed-sharing, we were both quite rudely awakened by a huge wave that decided to join us in our cozy little bunk. After the initial shock and surprise at what had just happened, all I could do was laugh and giggle hysterically at the ridiculousness of it all. I also happened to luck out and be furthest from the window, on the side that got the least wet. Poor Mr. Bed-mate had to spend the rest of the night sleeping on a wet and soggy mattress with no sheets at all. Optimistically, I only had to spent a couple of nights sharing the room with him as his tour finished a few days later. After that, no more new patrons came on the boat and I had the room to myself. Which was actually worth it, as while backpacking, you don’t often get a whole room to yourself. So the final result of sharing a cramped cabin and a bed with a stranger on a boat in some magical islands? An appreciation for flexibility and humor in what could have otherwise been a very uncomfortable situation while traveling, a new friend, and a funny story to share when I got home.